While reading about Geoffrey Bennison's passion for antique textiles, especially those floral-print documents which he was so fond of, I was reminded of Schumacher's 125th Anniversary collection. It's a collection that has been on my mind since last fall, not to mention a topic which I've been meaning to write about. 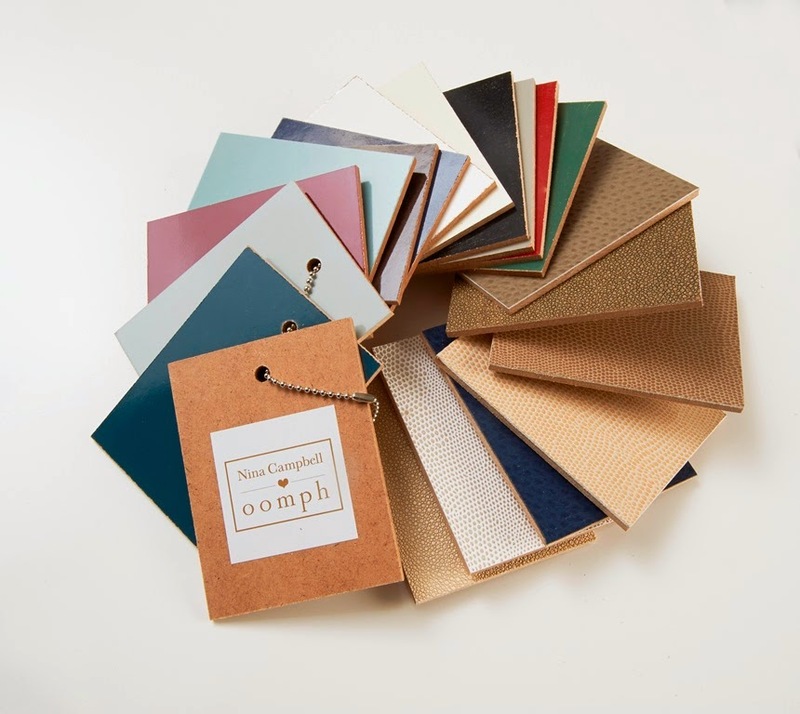 I'm sure many of you are already familiar with the fabric collection, which was conceived by Schumacher's Creative Director, Dara Caponigro. 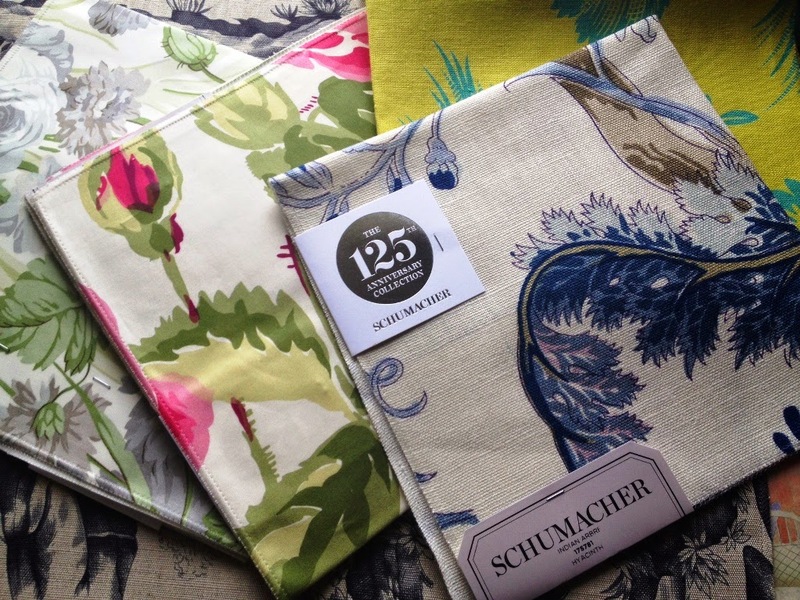 Dara, who has a passion for the history of design, went through Schumacher's extensive archives (the textile company has been in existence since 1889) in search of those fabrics that could be refreshed, rejuvenated, and reintroduced as part of the company's milestone collection. One of my fantasies is to be able to immerse myself in a textile archive with the task of pulling old fabrics and updating them for use today. Dara is living out my fantasy, so I confess to feeling pangs of good-natured envy. The anniversary collection features flamestitch, chevron, leopard, and toile. 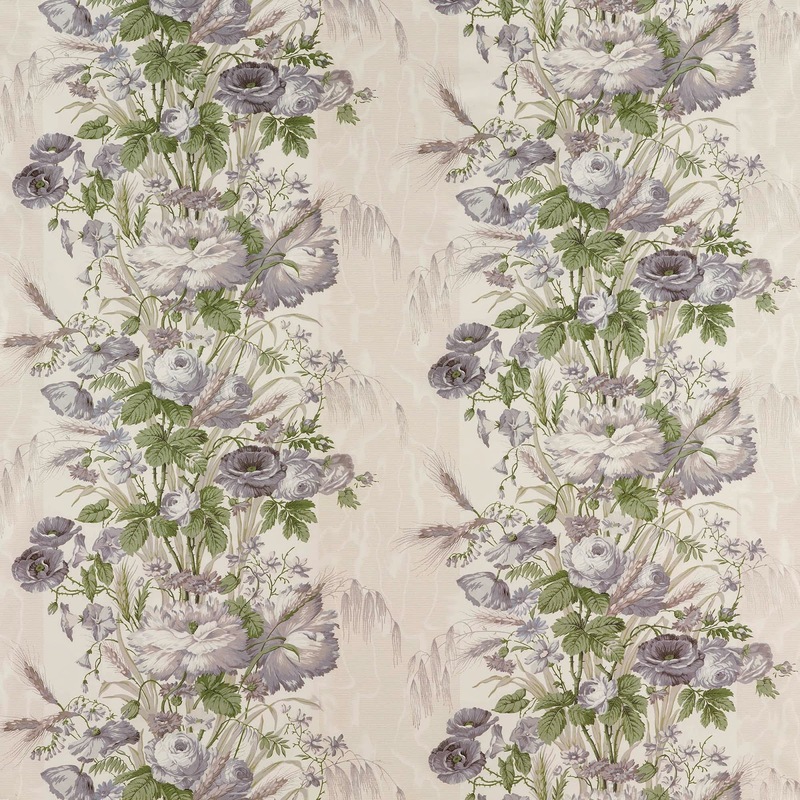 But floral prints in all their glory figure prominently in this collection, hence the Geoffrey Bennison connection I made earlier. 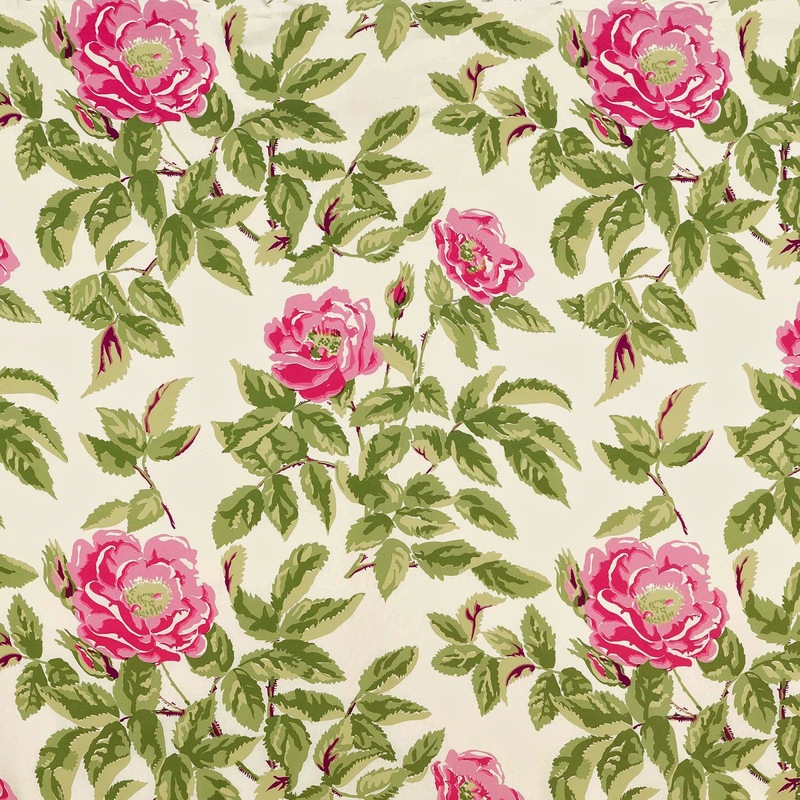 There is Boughton House, a wonderful poppy, peony, and rose print which was based on a Victorian-era document from the Schumacher archive. The Porcelain colorway would look especially striking when used alongside blue and white porcelain. 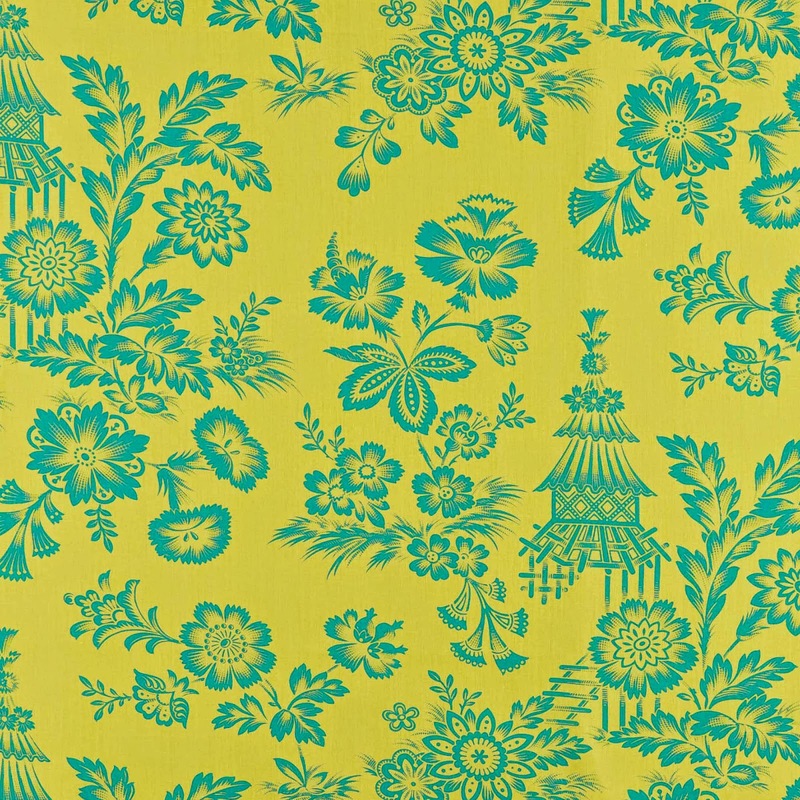 One of my favorites is Manor House, a cheery chintz that was designed by Dorothy Draper, who, by the way, created a number of fabrics for Schumacher. 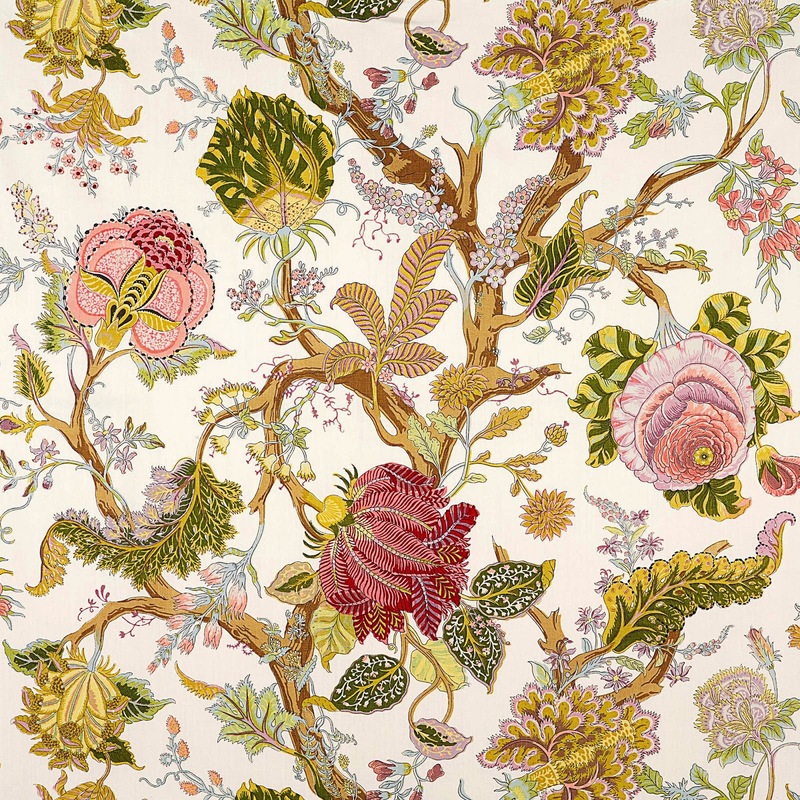 Indian Arbre dates back to the 1920s, when it appeared as a block-printed linen. And then there is Song Garden, which is a striking combination of flowers and pagodas. Inspired by an 18th-century French document, this print has been rescaled and colored so that it now has a graphic flair to it. 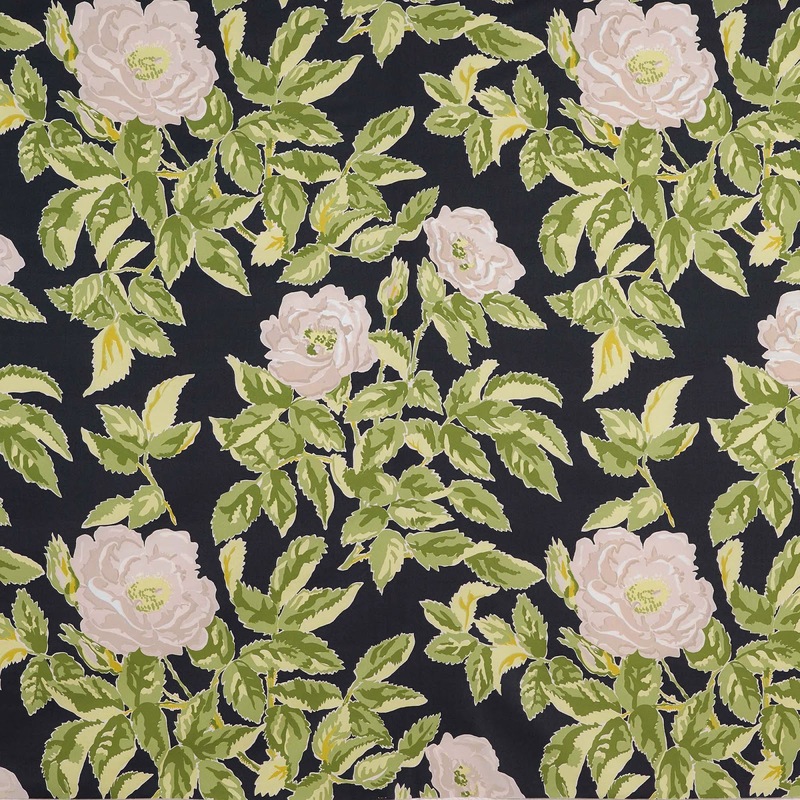 With such a range of floral fabrics, there is sure to be a print to please even the fussiest of flower lovers. 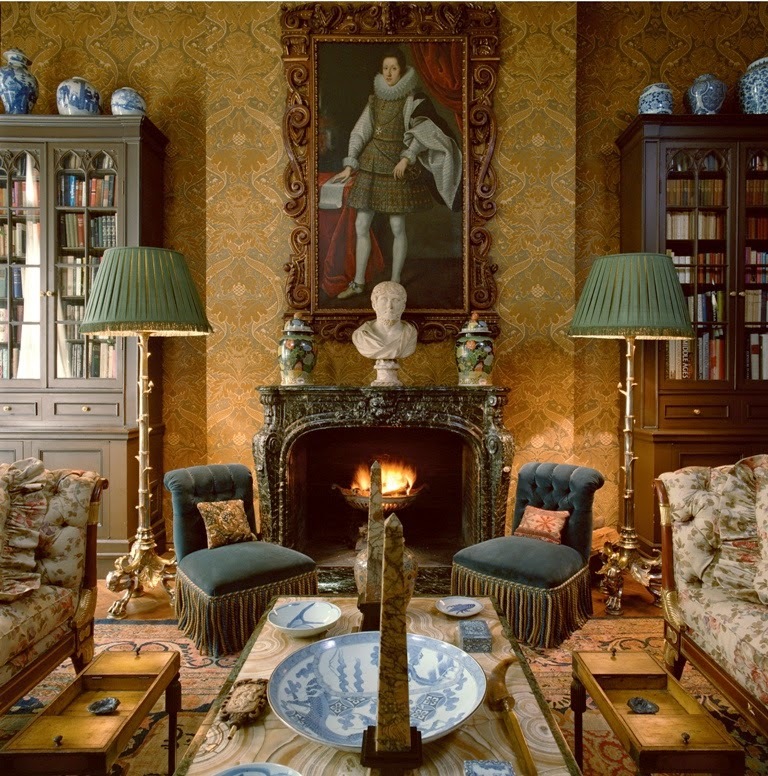 Like fellow designers Henri Samuel and François Catroux, the late British decorator Geoffrey Bennison's name is not as well known in America as, say, Billy Baldwin or Dorothy Draper. 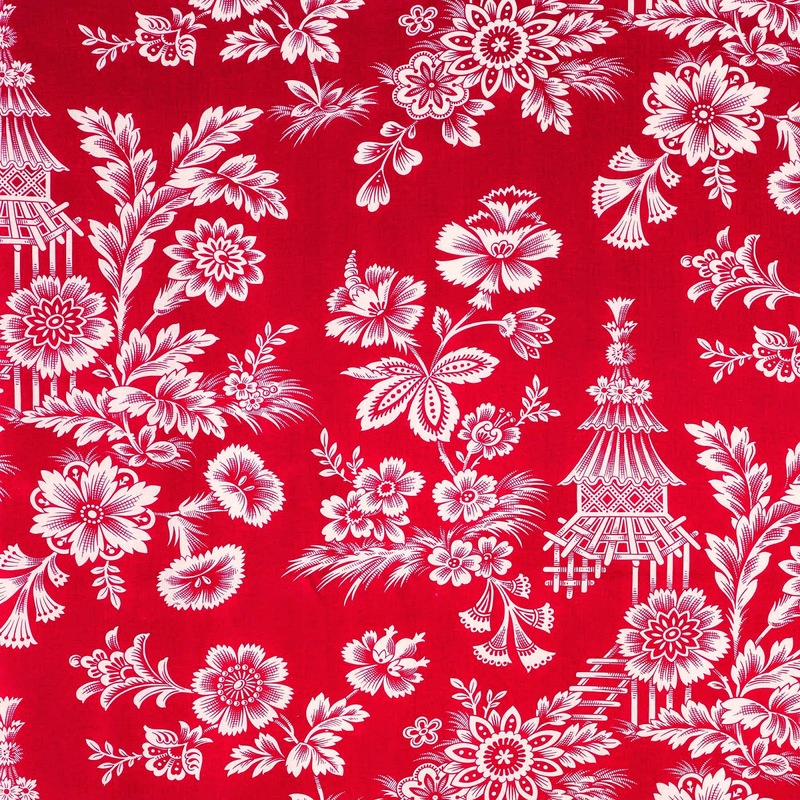 And I'd be willing to bet that some designers don't realize that Bennison Fabrics is named for the designer, whose reproductions of 18th and 19th-century textiles, which Bennison used often in his design work, form the nucleus of the collection. 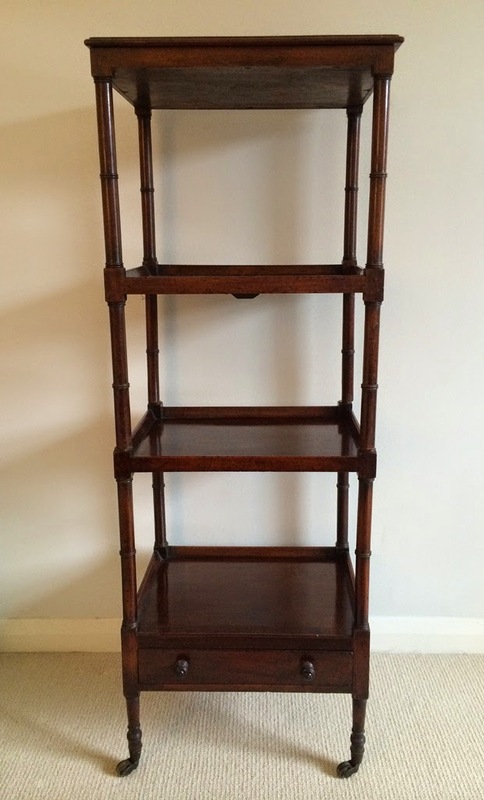 But Bennison deserves to be better known here in the States, for he was remarkably talented and a true "decorator's decorator", one who was equally admired as an antiques dealer. 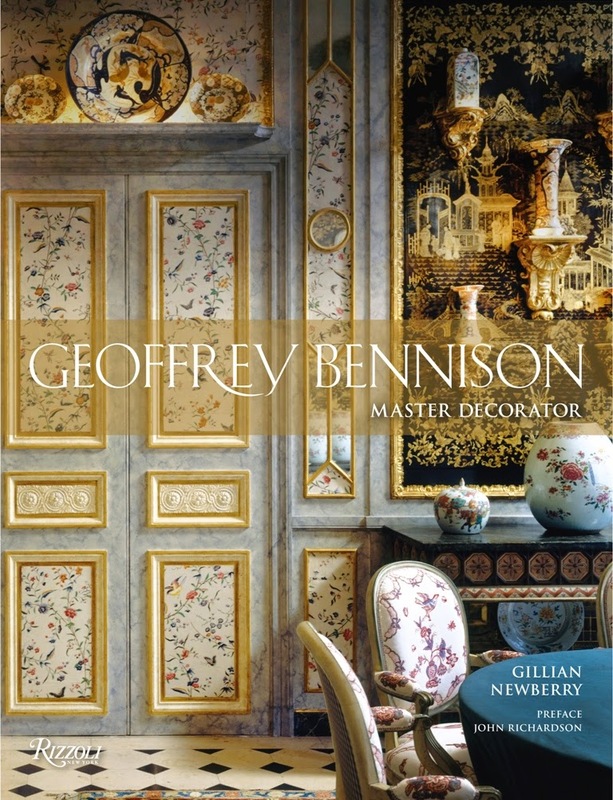 This might explain why there is so much buzz over the long-awaited monograph, Geoffrey Bennison: Master Decorator , which was written by his former assistant and Bennison Fabrics founder and president, Gillian Newberry. There is so much positive that I can say about this book, because it's a master class in first-rate decorating. 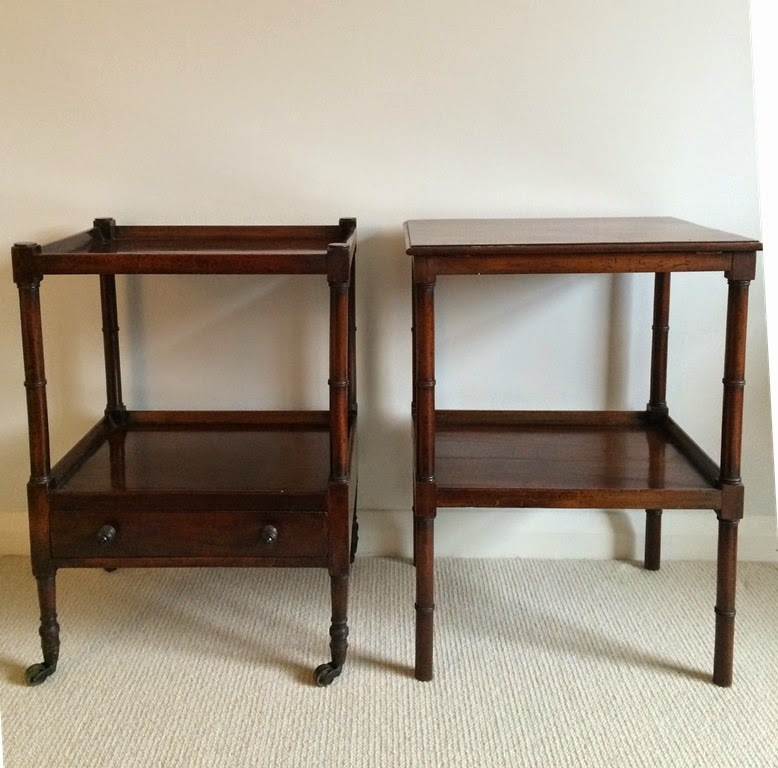 A Geoffrey Bennison-interior never flaunted its superb and often singular furnishings and finishes. 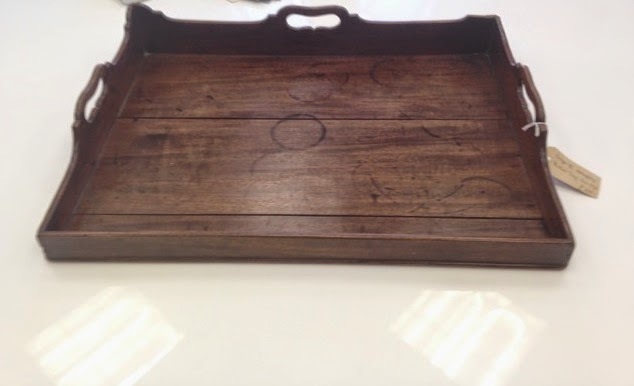 Instead, it presented itself as comfortable, unpretentiously elegant, and even a little time-worn. Bennison effected a style of decorating that on the surface looked so effortless, and yet, a great deal of effort was involved in achieving it. And Bennison was a marvel at conjuring up that most elusive and hard-to-create quality: atmosphere. If you are a design student or a new-to-the-profession designer, this book will not only introduce you to the work of one of the twentieth century's most talented designers, but it will also educate you about the significant roles that quality, craftsmanship, and connoisseurship should play in interior design. And if you're an old-hand in design, this book will remind you of the days when all three qualities were considered noble pursuits. 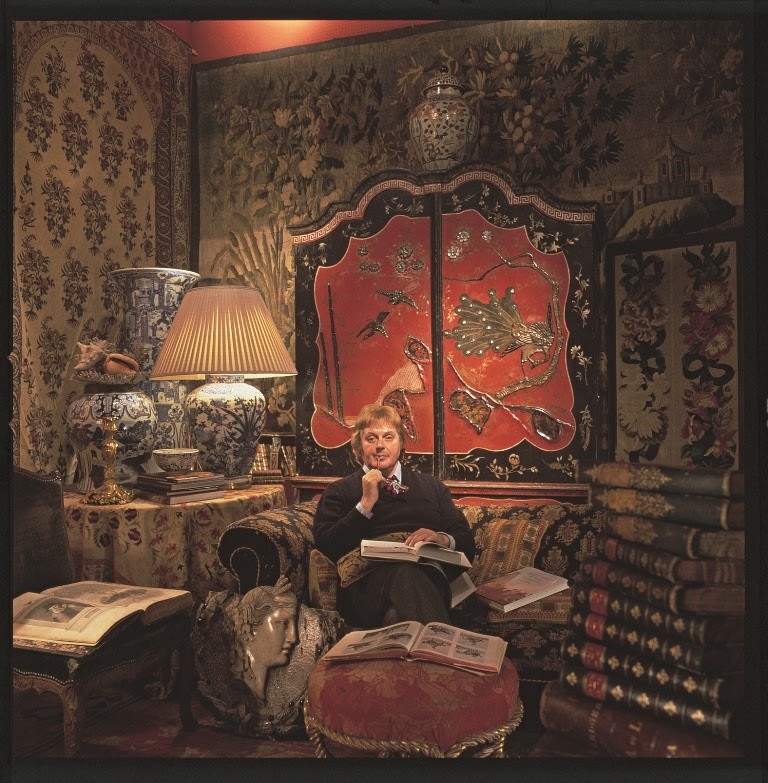 Bennison photographed at his Pimlico Road antiques shop, 1981. 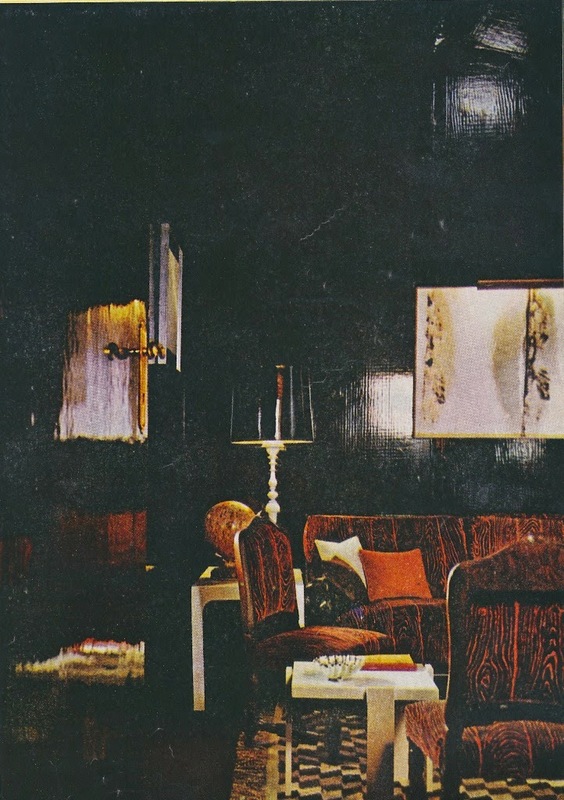 The library in Peter Glenville's Manhattan apartment, which was decorated by Bennison beginning in the mid-1960s. Glenville's close friend, Bennison continued to work on the apartment up until his death in 1984. 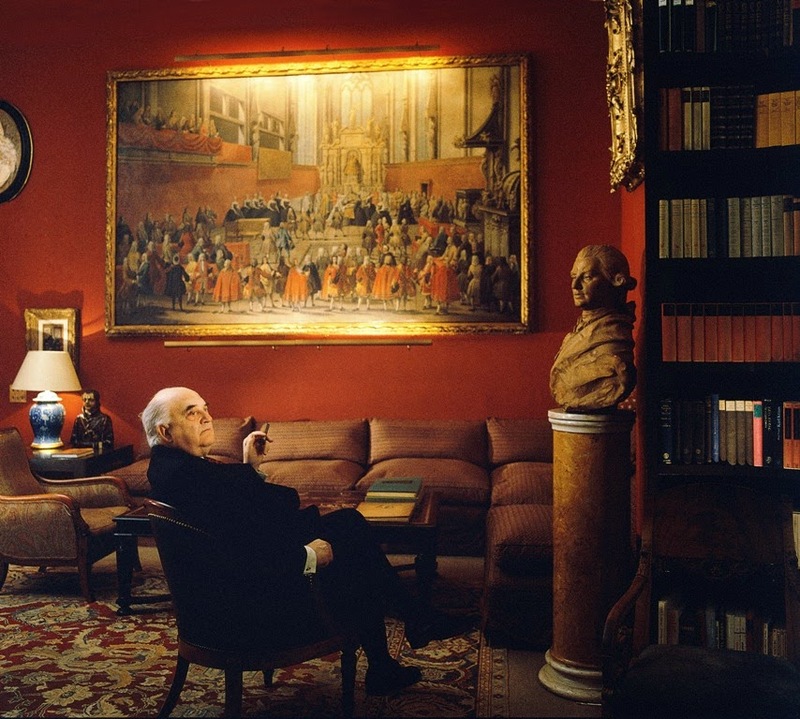 One of Bennison's most high-profile projects was for publisher Lord Weidenfeld. In this photograph, Weidenfeld can be seen in his Bennison-decorated Riverside apartment in Chelsea. These two photos show the Paris dining room of Princess Firyal of Jordan. Bennison considered his work for Princess Firyal to be some of his best work. 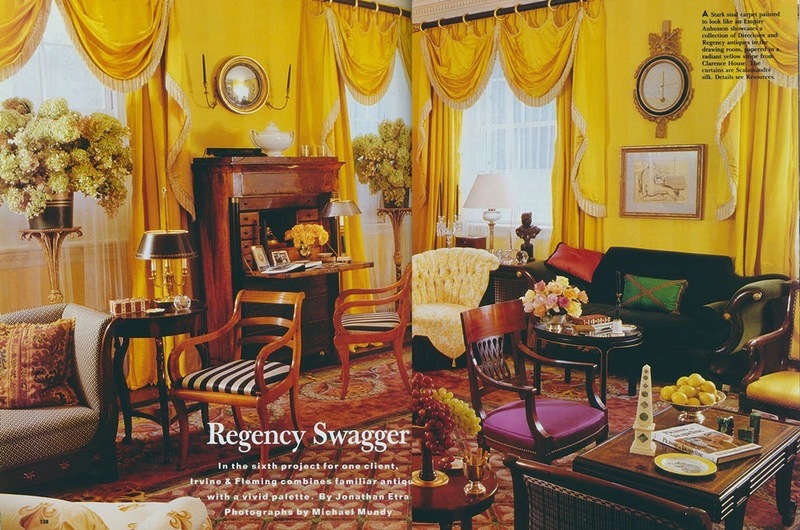 Image credit: © Geoffrey Bennison: Master Decorator by Gillian Newberry, Rizzoli New York, 2015. You've likely heard by now that Seventies style is back in fashion...again. Much has been written about this latest bout of Seventies fever, which seems to strike those who didn't experience this decade the first time around. 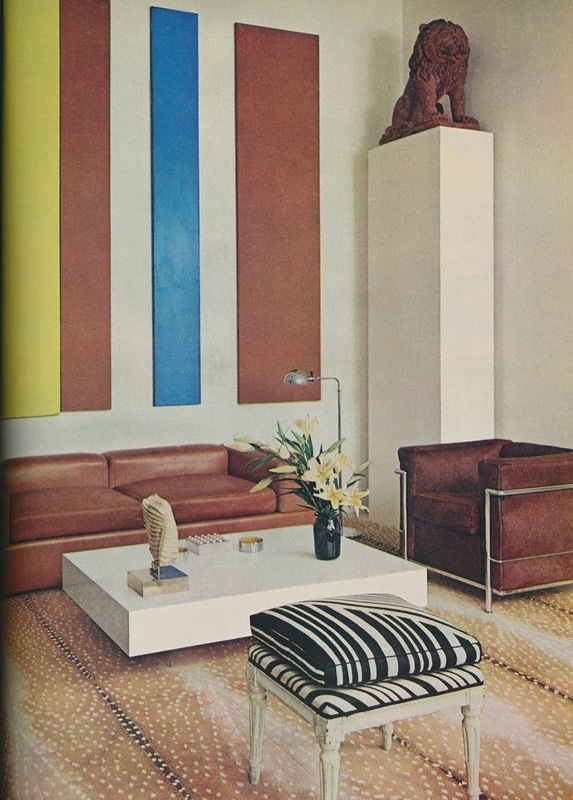 Under the circumstances, it only seems fitting that we revisit a few interiors that were published in 1970. 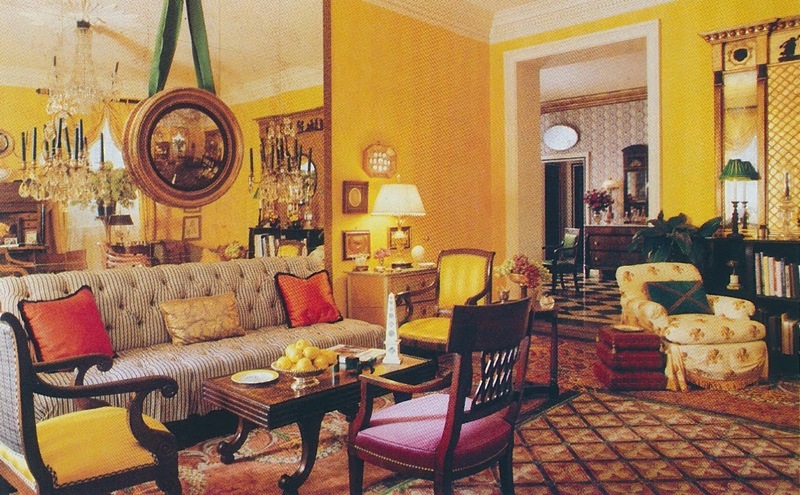 I don't think we should copy that decade's decorating room for room, but there are elements in each of these chosen interiors that, when taken out of their 1970s context, are really kind of fabulous. 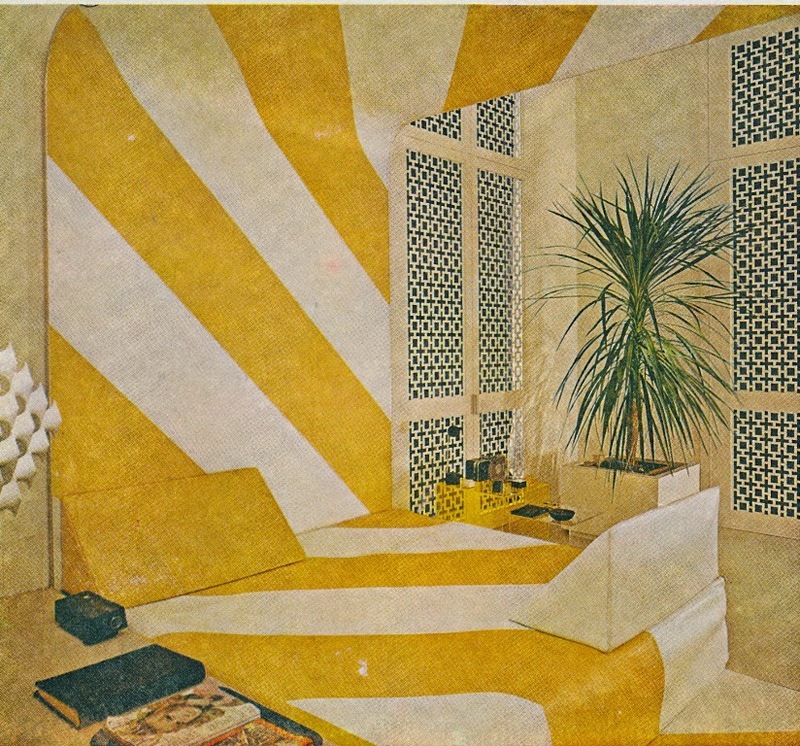 So, what were prominent decorators up to at the dawn of the 1970s? Let's start with Albert Hadley, whose Manhattan living room is shown at the top of the post. I'd say that's a room that looks terrific no matter the decade. Editor's Note: Since I wrote this article last week, I have read two more articles about the allure of 1970s-style, one in Bazaar and the other in T. I think this post will be the last on Seventies style for a while. You could say that the bedroom of designer François Catroux and his wife, Betty, reflects a very specific moment in time. However, you could also say that Catroux was forward-thinking in the way he decorated this space. 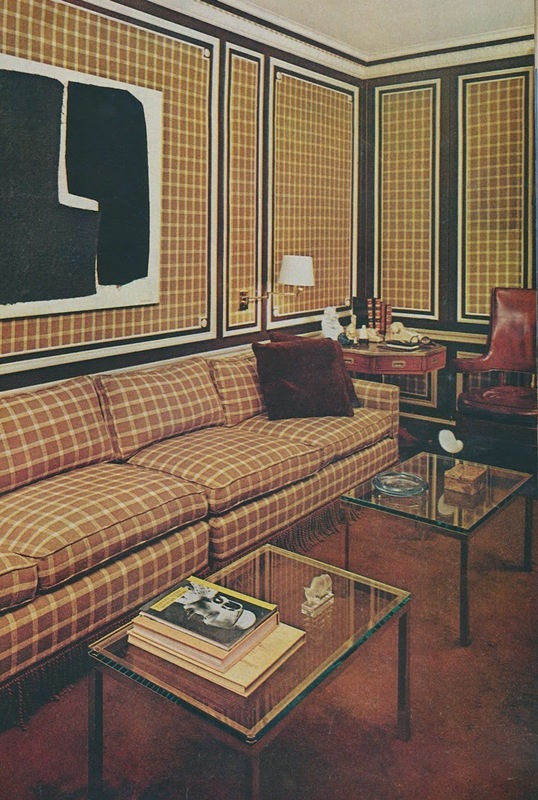 Innovation helped to drive decorating through the 1970s. 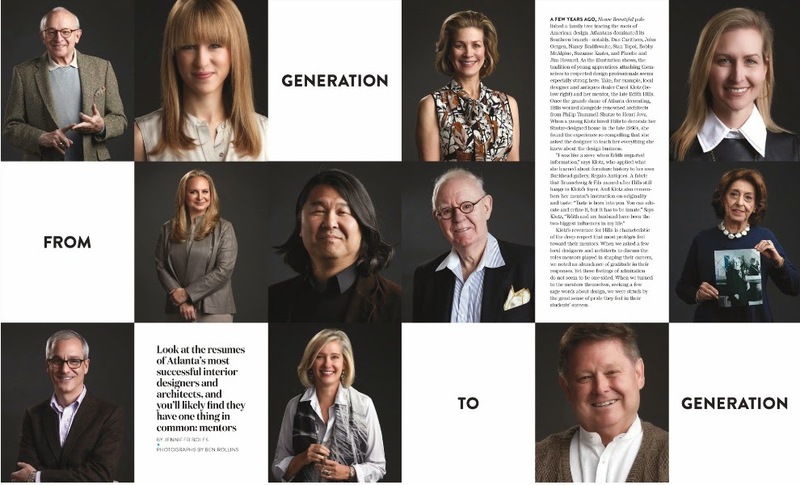 It was anything but a stagnant decade in design history. 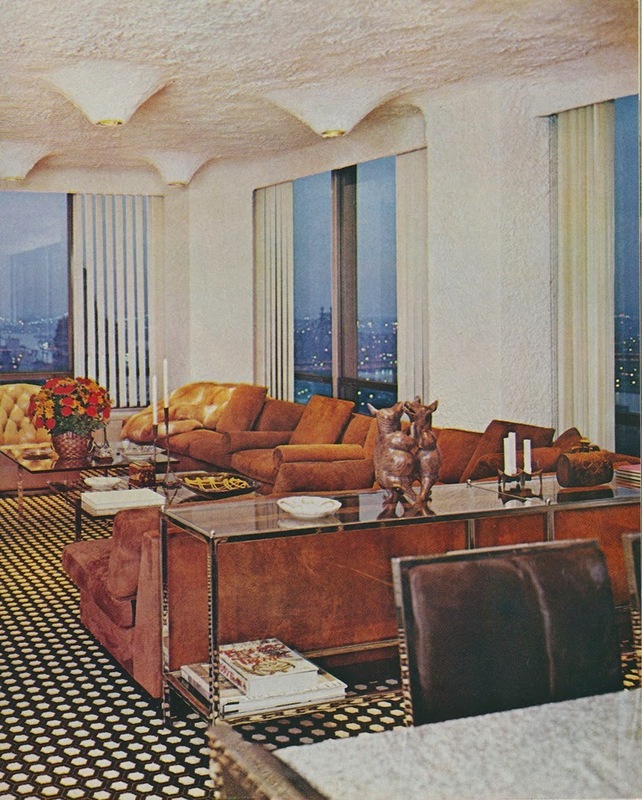 The U.N. Plaza apartment of Mr. and Mrs. Stanley Schneider, which was decorated by Burt Wayne and John Doktor. I admire the chrome furniture as well as the David Hicks carpet, but those vertical blinds and stalactite diffused lighting? Not so much. 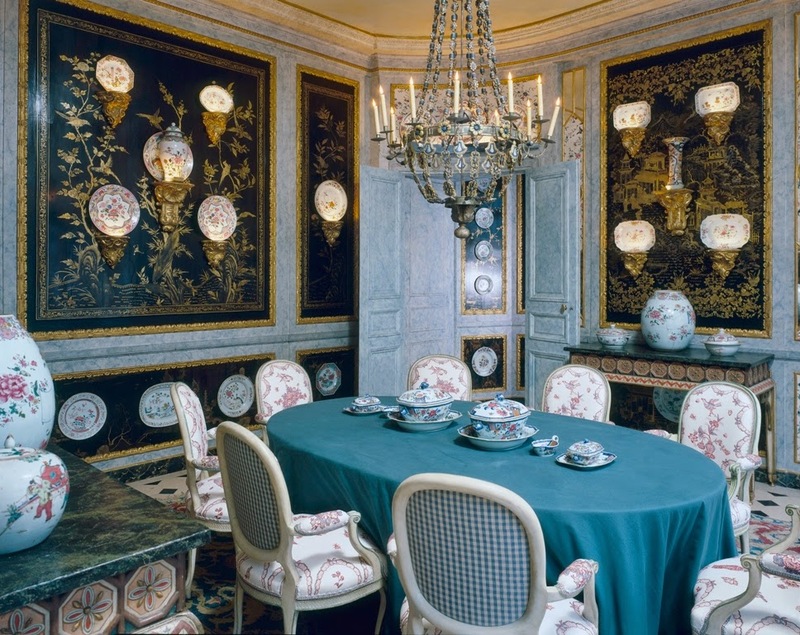 The London dining room of Mrs. John Duffield, which was designed by Count Alessandro Albrizzi. 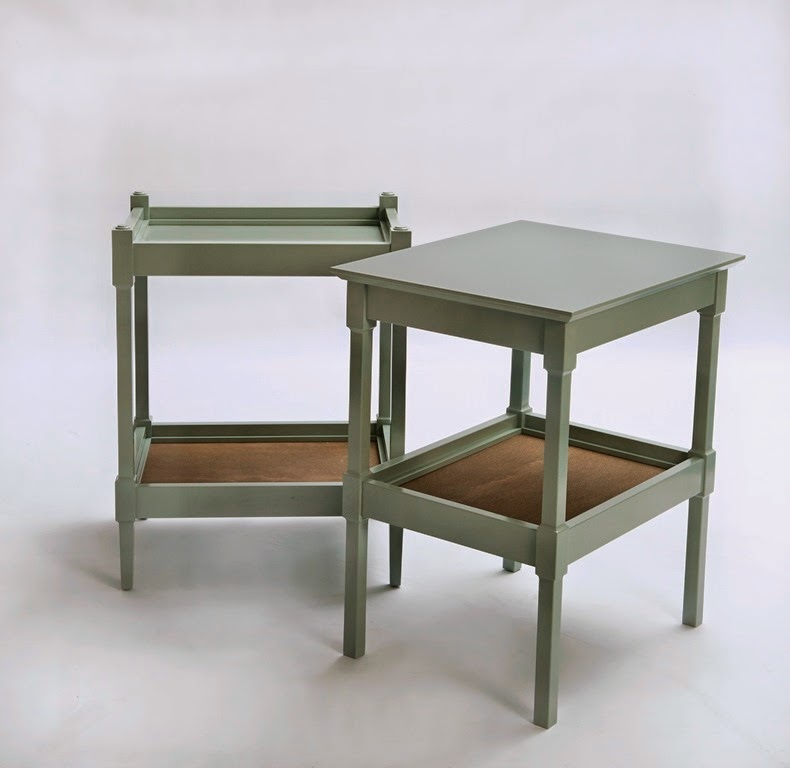 Albrizzi also designed the octagonal glass dining table as well as the carpet. 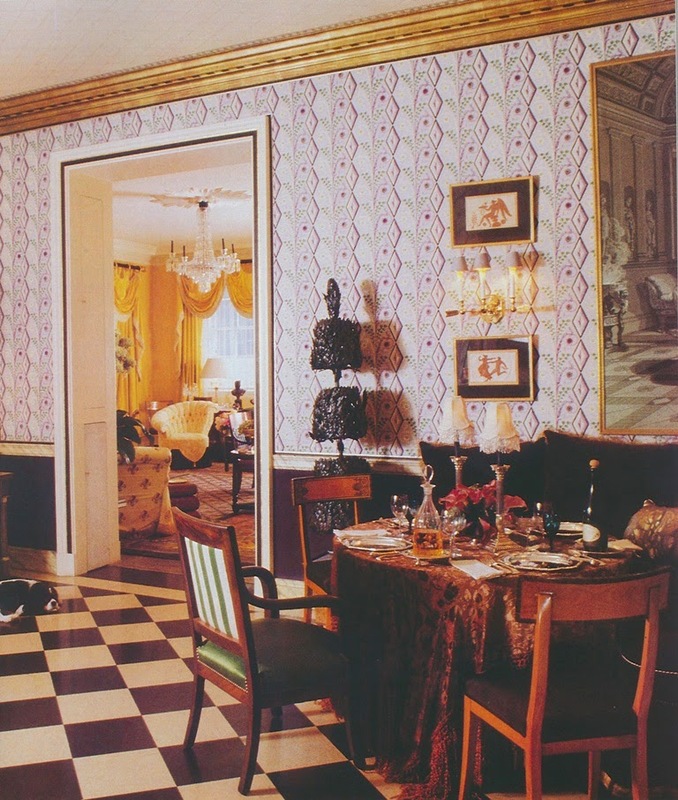 Just imagine the dinner parties Mrs. Duffield hosted in this room...and just imagine how exhilarated Albrizzi must have felt while decorating this room. 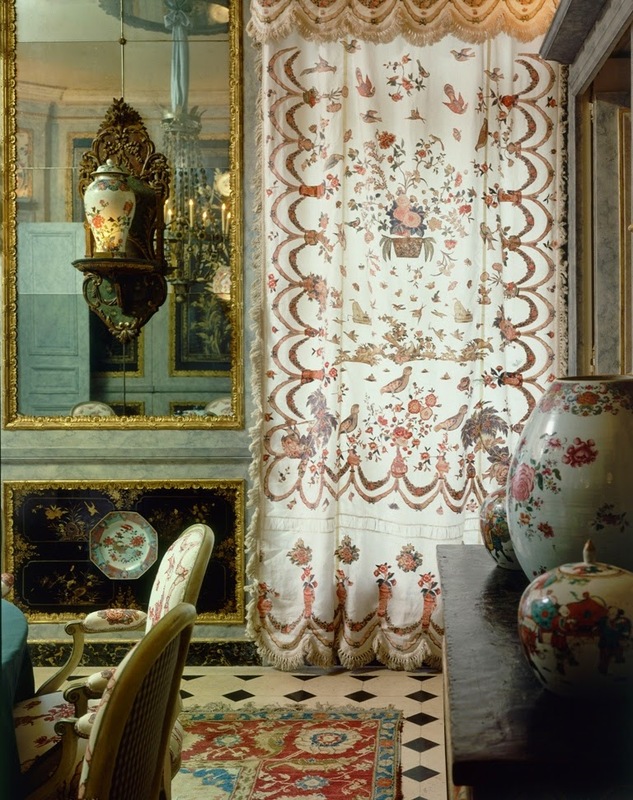 Designer Val Arnold was behind the décor of this card room, which boasted then-de rigueur flamestitch fabric. 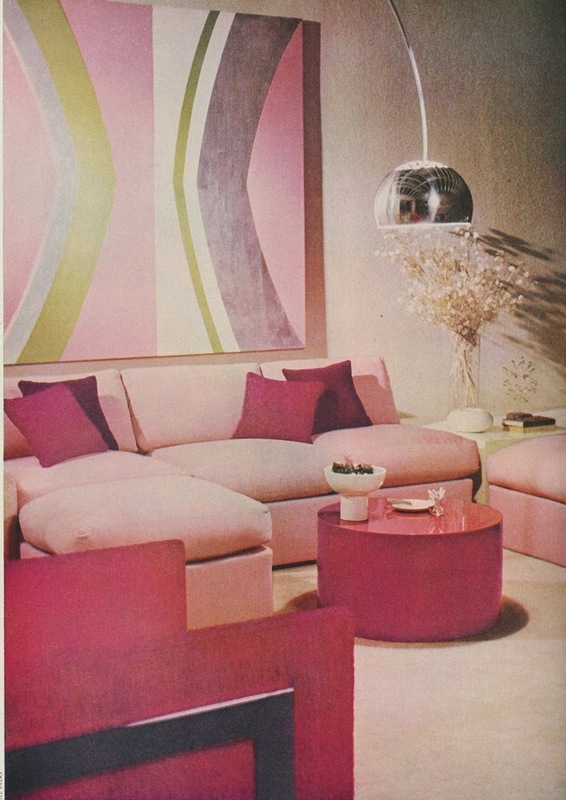 A sophisticated pink palette, courtesy of Milo Baugham, who designed this living room. 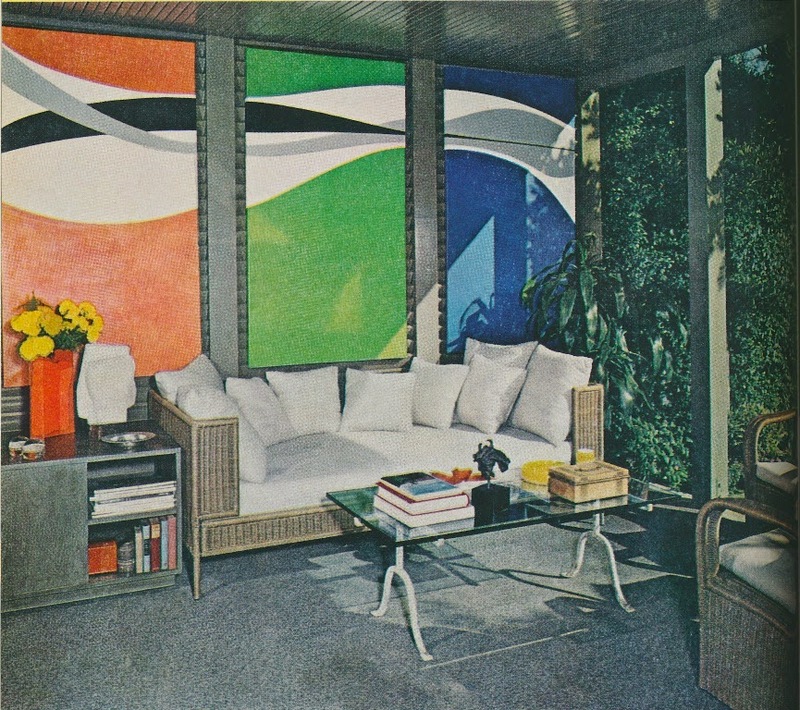 Designer Arthur Elrod chose this colorful triptych by artist Helen Munkacsy for his Palm Springs vacation house. 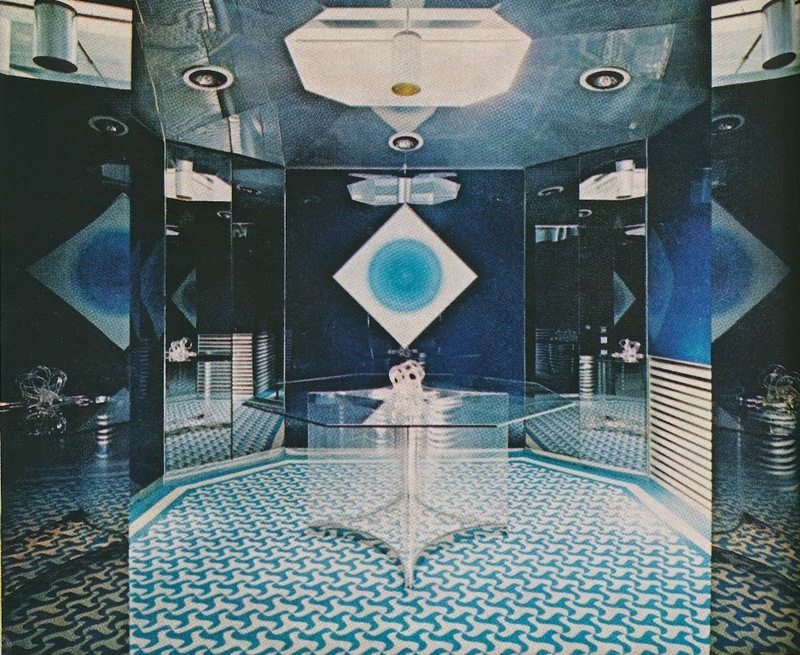 Bright, bold colors were a hallmark of 1970s decorating. Designers Stuart Blaine and Robert Booth used colorful wall decorations (the canvases were painted by the designers) as a counterpoint to their living room's neutral color palette. 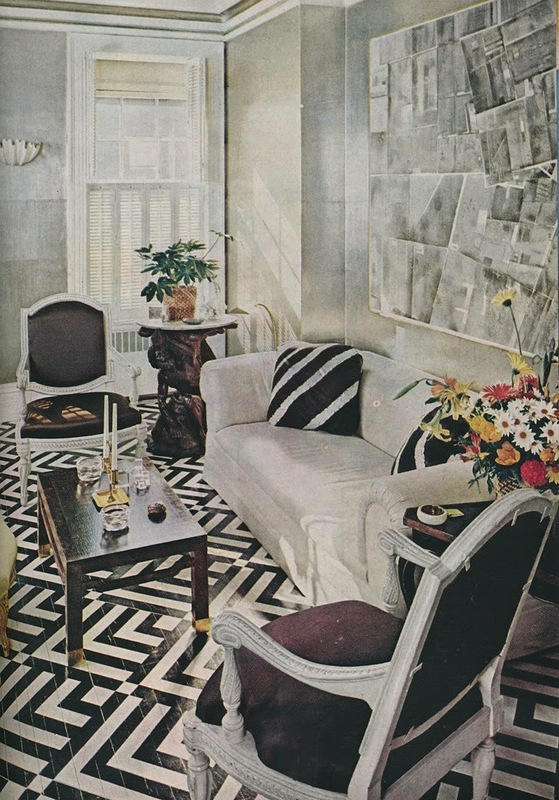 The furniture, not to mention that Stark antelope-print rug, look just as good today as they did back then. Between you and me, I kind of like vinyl wallcovering, but only if it's high-quality. The dark brown vinyl-covered walls and ceiling look dramatic, if not slick, in the Milan home of antiques dealer Dino Granzin. Designer Thomas Britt went for it with camel-colored plaid in the New York City apartment of Bernard Relin. 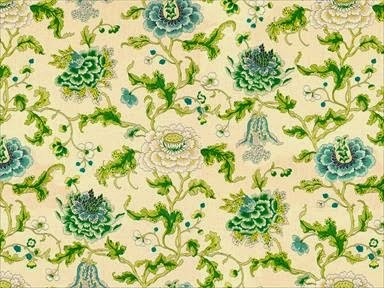 I have been a fan of Brunschwig & Fils fabrics for as long as I can remember. It is their snappy prints to which I really gravitate, because they seem the natural companion to my preferred style of decor: classic; polished; well-mannered yet not at all boring. They also remind me of the good ol' days of American decorating. 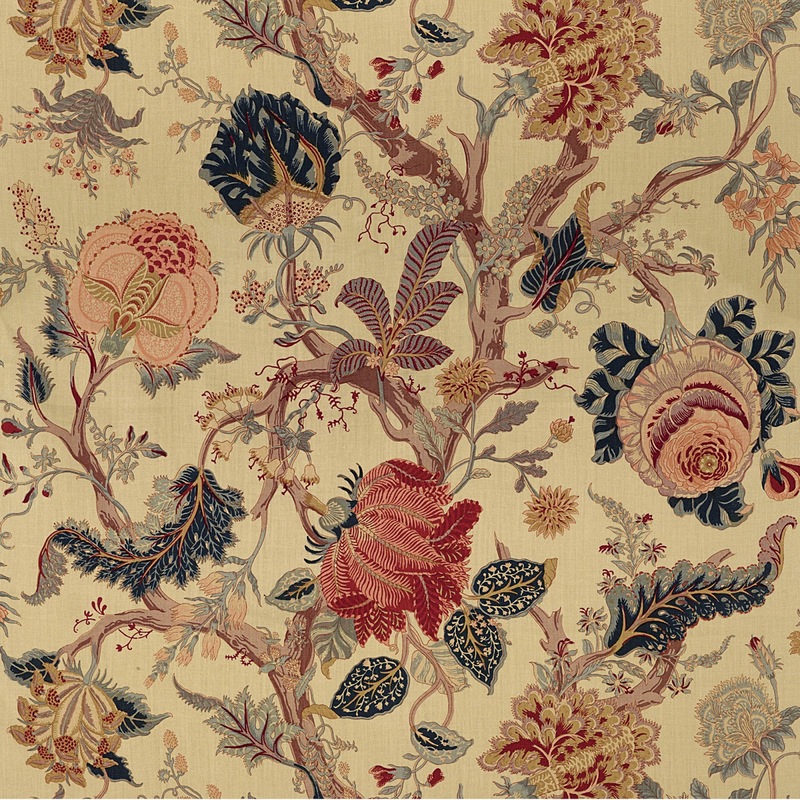 But I think that one of the biggest assets of Brunschwig & Fils' prints is that they are versatile- perhaps more versatile than some people realize. To see this versatility in action, look no further than the Palm Springs home of designer Michael S. Smith and James Costos, the U.S. Ambassador to Spain. Recently published in the April issue of Architectural Digest, the house, which was built in the early 1970s, was designed by architect Howard Lapham. What I find remarkable about the house- in addition to its spectacular setting, of course- is its unusual architectural style, one with which I was completely unfamiliar. The house was designed in the Mayan Revival style, hence those striking carved motifs that appear both on the home's exterior and in its interior. 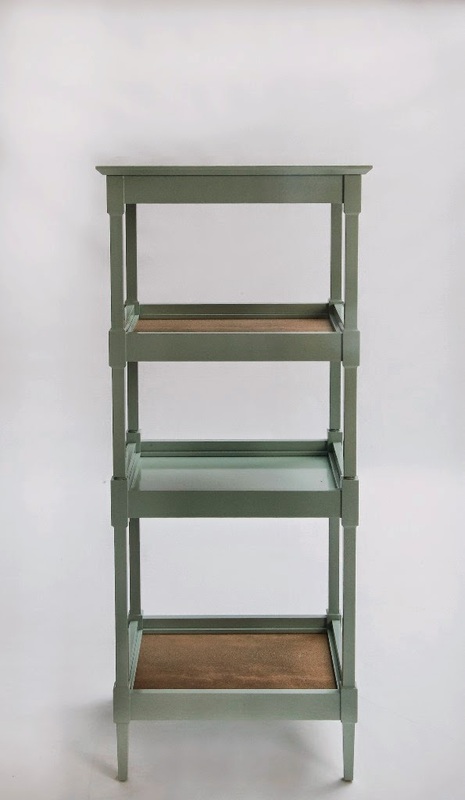 When it came to decorating the house, Smith went for a blend of sophisticated 70s-era furniture and new pieces from his Jasper line, while the predominate color palette, which evolved from the hues found in the home's travertine floors, is a pleasing mix of neutrals and green. 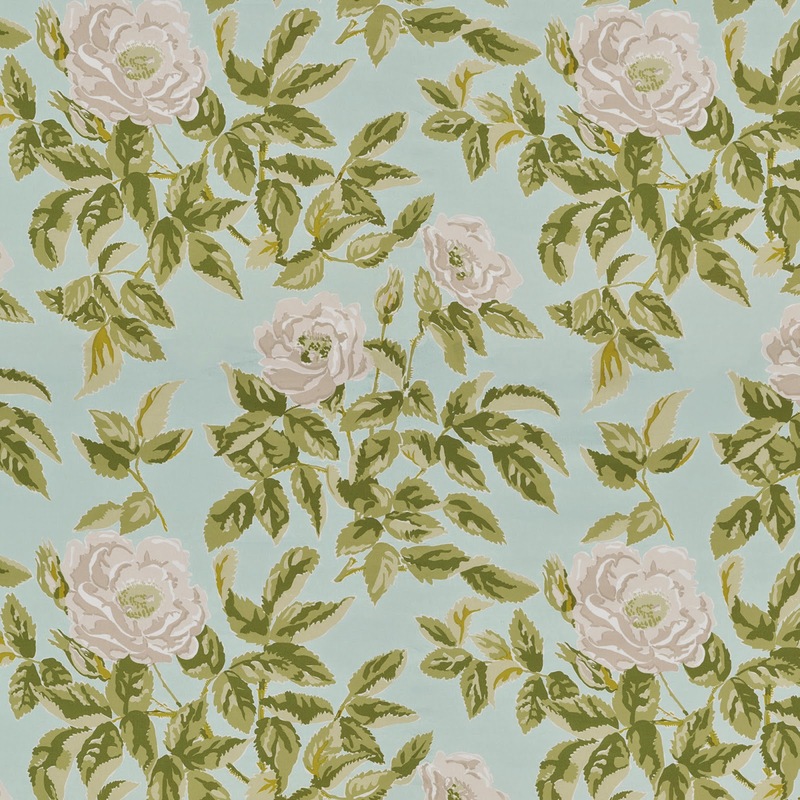 What really caught my eye, though, were the Brunschwig & Fils fabrics that Smith used throughout the house. 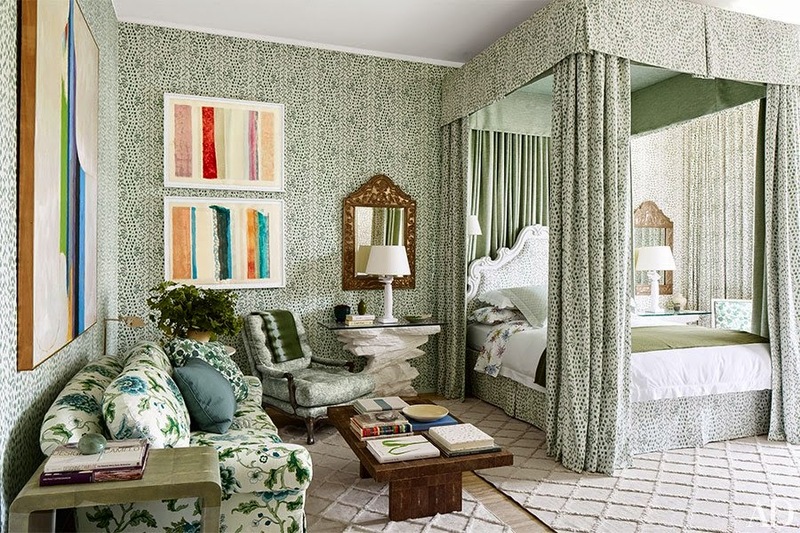 Smith is the Consulting Creative Director of Brunschwig & Fils, so his use of their fabrics might be expected. 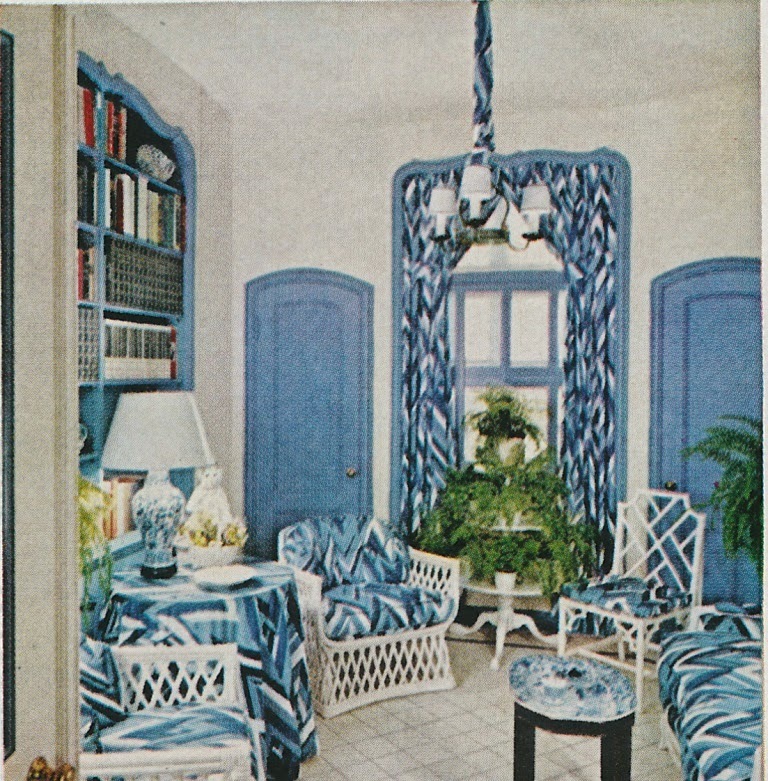 But perhaps what isn't so expected is how some of Brunschwig's more traditional prints can look so at ease in a quintessential 1970s Palm Spring house. This is the versatility to which I referred earlier. 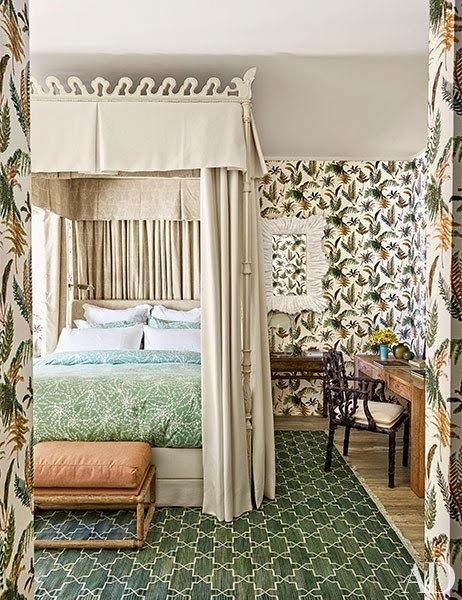 Who knew that the much-loved fern print, Les Fougères, could look so at home in a Mayan Revival house? Michael Smith, that's who. 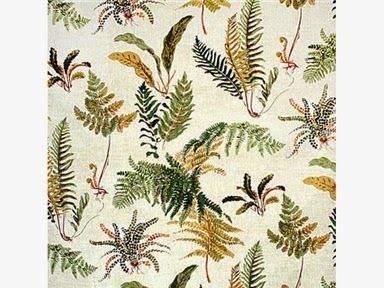 I believe that most of us are familiar with Les Fougères, that classic fern-leaf print which is so closely associated with Elsie de Wolfe. 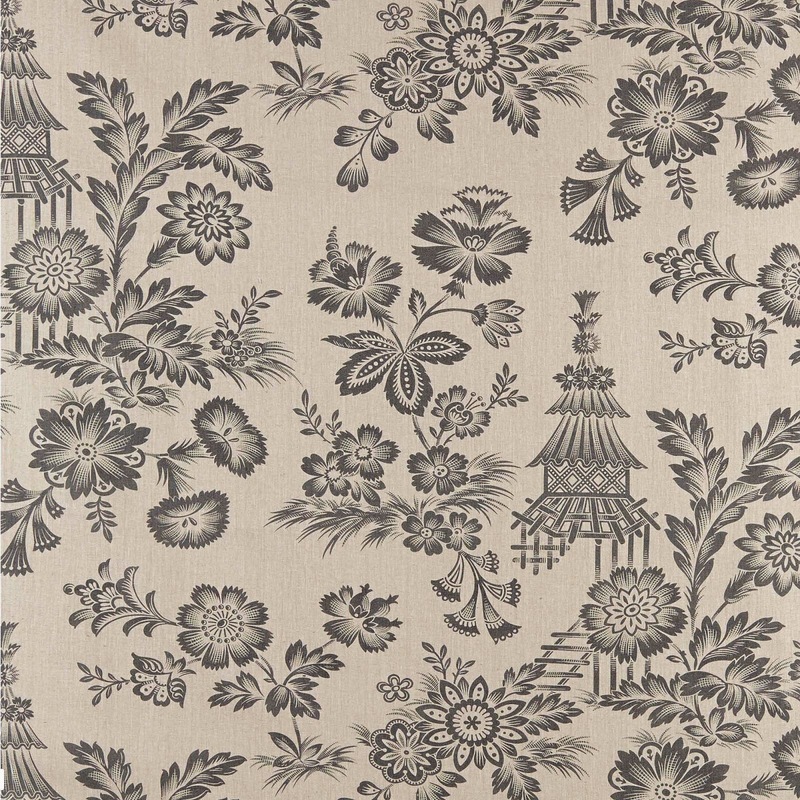 For me, Les Fougères has traditionally conjured up thoughts of garden furniture, sunrooms, and wicker. (In fact, in the illustration that accompanied my book's entry on "Faux Bois", it was Les Fougères that covered a rustic faux-bois bench.) 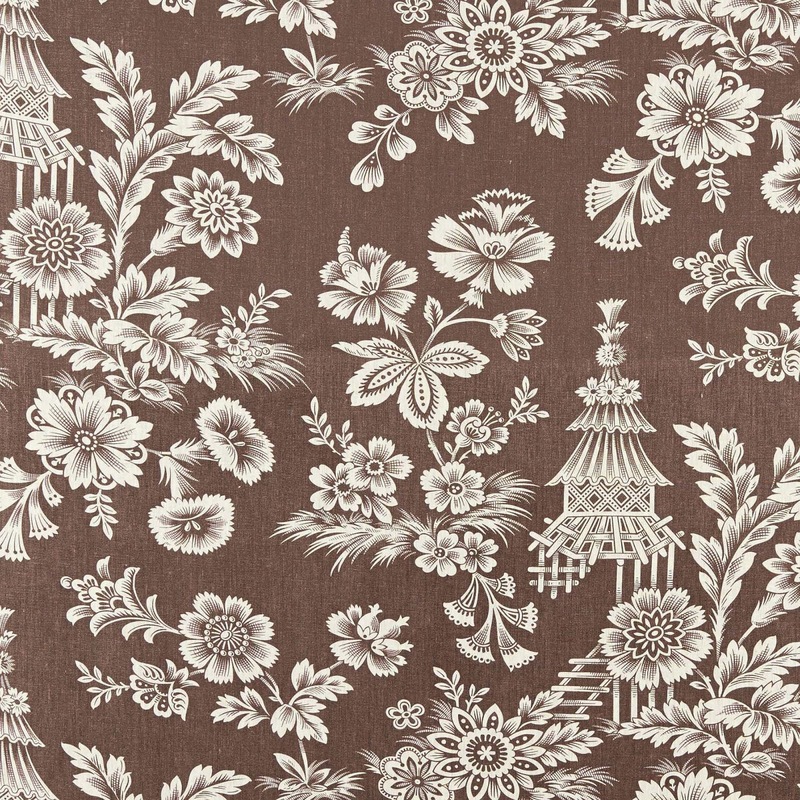 But when covering the walls of Smith's guest bedroom (see above), the fabric has a more modern feel to it. The print seems earthier than when I've seen it in the past, something which I attribute to the room's desert color palette and sophisticated mix of furniture. 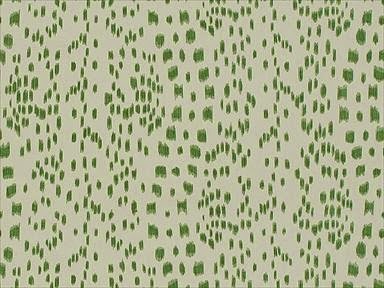 Another print which needs no introduction is Les Touches, Brunschwig & Fils' classic snow-leopard print cotton fabric, which was introduced in 1965. Michael Smith joins the ranks of Geoffrey Beene, Van Day Truex, and Billy Baldwin, all of whom employed this fabric to stylish effect. But the green colorway, which Smith chose for another guest bedroom, is a nice departure from the oft-used black and cream colorway. It was also the most logical choice for a home in the desert. In the AD article, Smith mentions that he "wanted to do whole rooms in prints. It's the 18th century fast-forwarded to the 1970s." And using a single print throughout a room is, in my opinion, one of the best ways to use Les Touches. It's also easier to do now that Brunschwig offers Les Touches in a coordinating wallpaper. 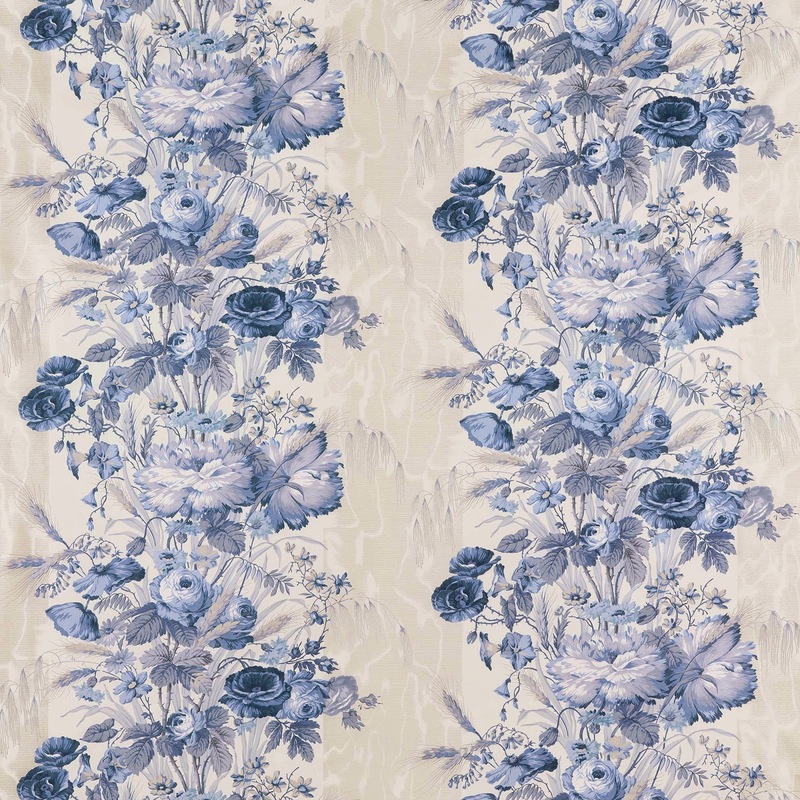 The printed fabric that is seen below the photo of Les Touches is New Athos in spring/aqua, which Smith selected to cover the bedroom's sofa. Like Les Touches and Les Fougères, New Athos has a long and interesting history. 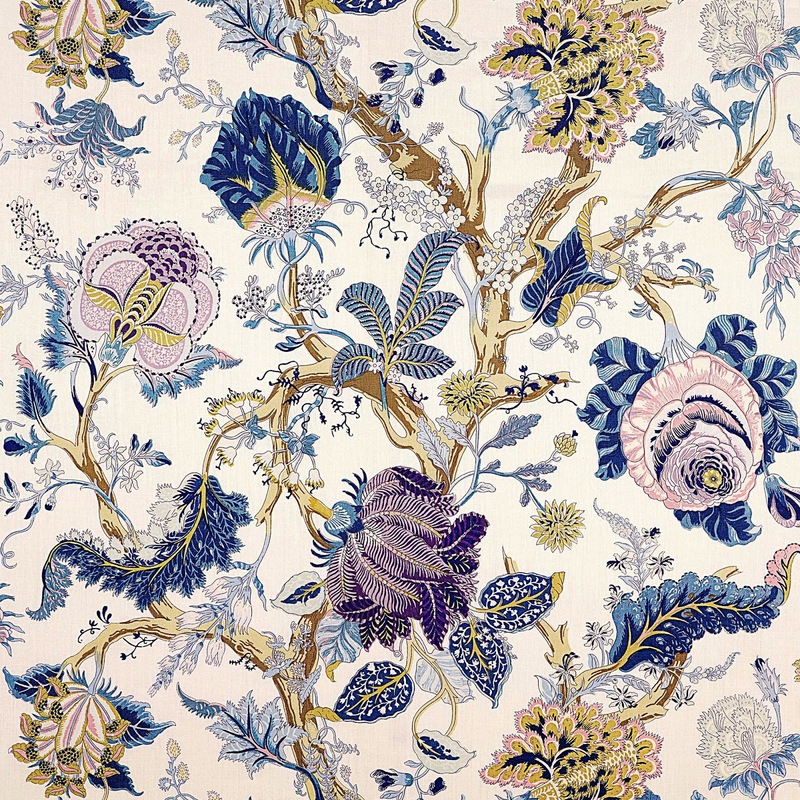 The print, which was inspired by an 18th-century hand-painted Chinese silk fabric, was introduced by Brunschwig & Fils before World War II, making it one of the longest-produced prints in Brunschwig's history. The print was updated in 1980. 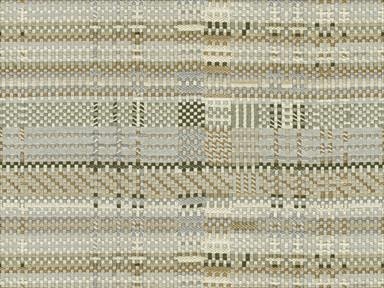 And finally, we have New Watson, a woven fabric that was first introduced by Brunschwig & Fils in the 1980s. 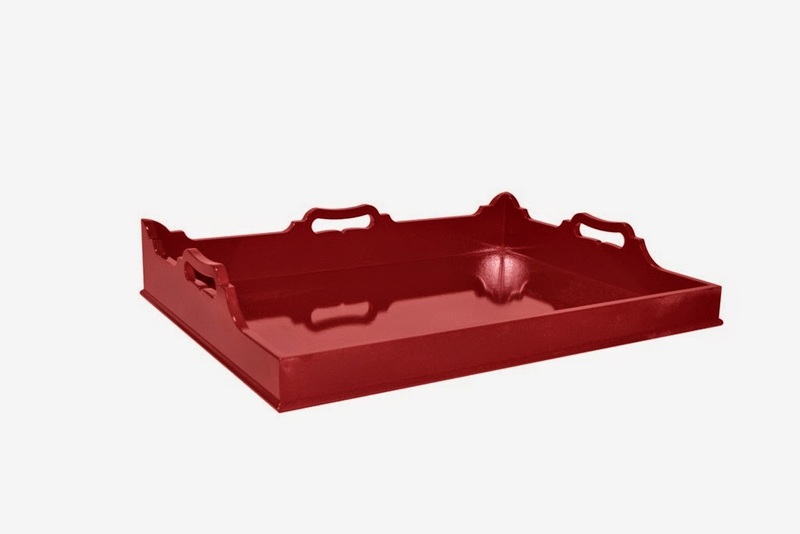 It has since been updated in new colors and with a weightier feel to it. Smith chose New Watson in the pewter colorway for banquette in the home's living room. 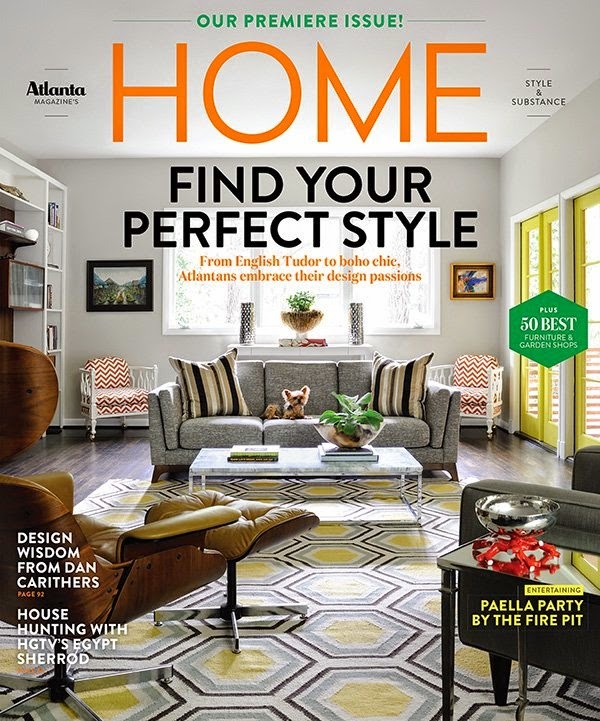 Interior photos from Architectural Digest, April 2015, Roger Davies photographer. Fabric swatch photos courtesy of Brunschwig & Fils. The first thing that one typically does after buying a home is to furnish and decorate it to one's liking. That might mean a fresh coat of paint, discarding curtains, or ripping out carpet. But what if Sister Parish had once decorated your new home or, even better, lived there? Would you strip away all of those Sister Parish touches? I wouldn't, because any Sister Parish leftovers would make me love my new home even more. However, not everybody feels as I do. Take the Manhattan apartment seen here. Located at 960 Fifth Avenue, this is the maisonette in which Parish once lived. By 1990, when these photographs were published, the apartment had a new owner, who hired Keith Irvine of Irvine & Fleming to decorate it. Assisted by Richard Keith Langham, Irvine set out to take the apartment "in a different direction" from the one Parish had taken, which, according to Irvine, had made the home feel like "a Yankee vision of a London house." The homeowner concurred, deeming Parish's décor "country and gardeny... It took me four months to get her presence out of the apartment." Well, each to his own. I would have been thrilled to have had Parish's presence in my home, but that's just me. Nevertheless, Irvine's work on this apartment is worth discussing. The dining room's Directoire wallpaper, which is one of my favorite Brunschwig & Fils papers, is quite handsome, as is the living room's yellow striped wallpaper from Clarence House. Look closely at those curtains. 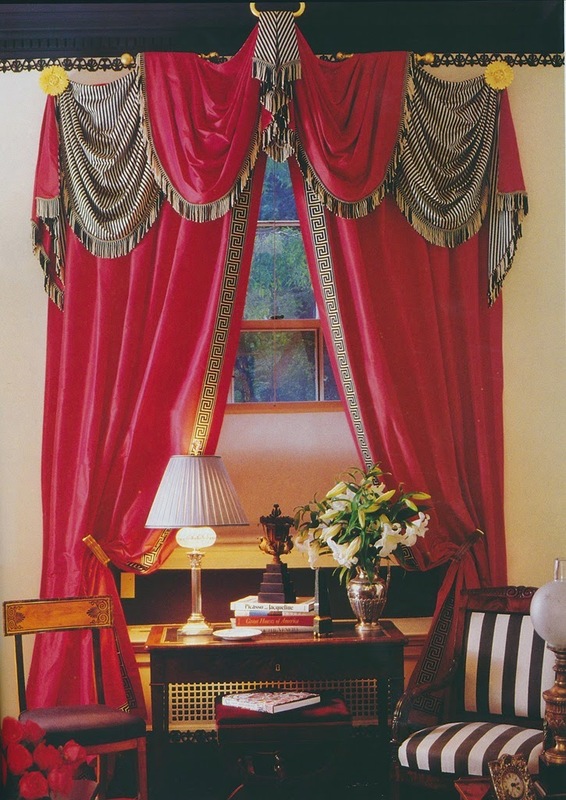 I realize that today's preference is for clean-lined window treatments, but we can learn a lot about craftsmanship and technique from the curtains seen here. And take note of the mirror above the living room sofa. This was one of the few remnants of the apartment's Sister Parish décor. Installed by Parish, the mirror remained in the new design scheme, although Irvine added a Clarence House wallpaper border to the edges. Of course, time marches on and so does this apartment's décor. You'll recall that not too long ago, Mario Buatta decorated this maisonette for a later owner, Patricia Altschul, who sold the apartment about two years ago. I haven't seen nor heard about the apartment's current décor. Have you? 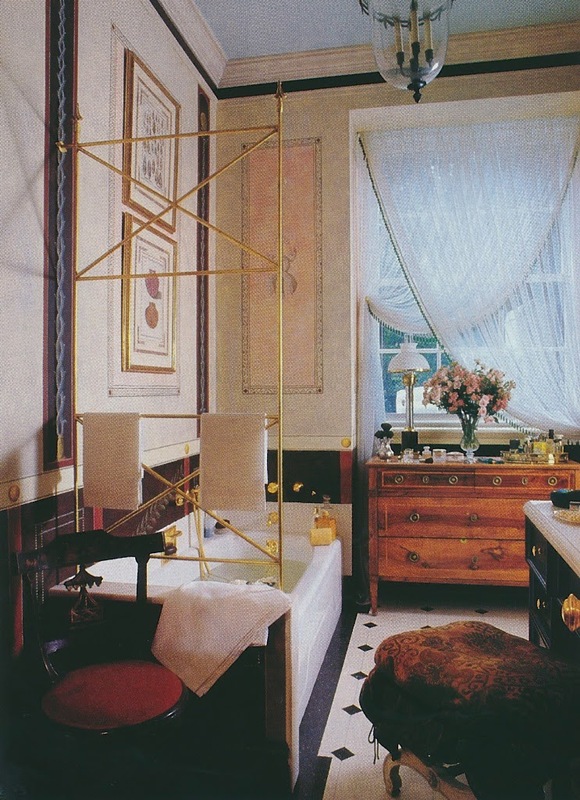 All photos from House & Garden, September 1990; Michael Mundy photographer.